The cord-free art display and streaming platform, Acanvas is a Wi-Fi connected and customizable art display that hangs on any wall, charges itself and streams art into your home. Acanvas is a Wi-Fi connected and customizable art display that hangs on any wall, charges itself and streams art into your home. Acanvas features a first of its kind app that uses curated Art Stations to stream new artwork from a variety of artists and genres. The Acanvas app is available for iOS and Android devices. 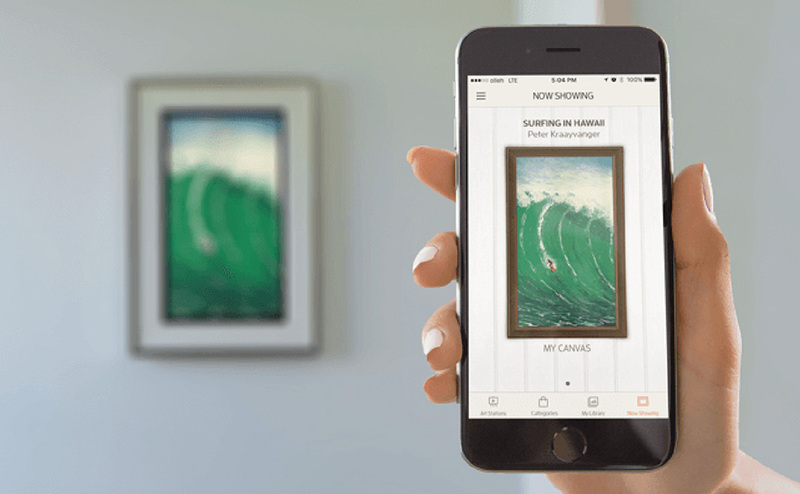 Acanvas represents the easiest way to have millions of artworks displayed in your home. It’s easy to setup, it comes with an onboard battery, a self-powered retractable cord and a portable changing station. Acanvas features an onboard battery, a self-powered retractable cord, and a portable charging station. Acanvas can be easily set to charge when you are not at home. It can also detect darkness with the help of the ambient light sensor and charge itself when everyone is asleep. We are offering a choice of two timeless frame options that can help make Acanvas your own. Black-brown or silver frames with sleek white mattings are available, or you can use Acanvas by itself for a clean, modern look. Multiple frames can also be controlled through the Acanvas app to harmonize and expand your wall space. With Acanvas there will never be a dull moment in your house. We have partnered with Fine Art America to have available for you millions of art pieces through the Art Stations. If you want to hang on your wall your own photos, you can do that through the Acanvas app. Would you like to know more about this project? Reach out today!